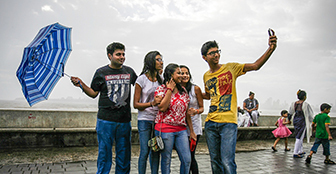 Police in the Indian city of Mumbai have identified 16 dangerous selfie spots after a man drowned trying to save a girl who fell in to the sea while taking a photo of herself. The spots include the major tourist attractions of Girgaum Chowpatty beach and Marine Drive promenade as well as the site where the 18-year-old slipped last month, the deputy commissioner, Dhananjay Kulkarni, said. Police patrolling the selected areas have been briefed to warn people against taking selfies, he said.